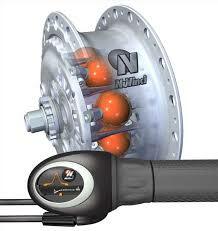 The Nuvinci Planetary CVT allows for a bicycle to have an unlimited number of gears within a certain ‘range’. The only problem is that all of the Nuvinci CVTs that are currently on the market are only warrantied with a 250 watt motor, or in the case of the N380 350 watts (as long as it’s not a cargo bike). On the Internet, I had heard rumors of plenty of people who had put the old-school N171 CVT under around 3000 watts without damaging it. Although the N171 is tricky to find as it was discontinued 6 years ago, there are still plenty of them floating around out there to be had. They are monstrously heavy at about 8.6 lbs for the CVT alone, not counting the shifter or other mounting hardware. This extreme weight means that the CVT might make sense for road use, but is just too heavy to be enjoyable on singletrack trails. I tested a Nuvinci N171 that I bought for about $100 on endless-sphere pretty extensively with a 3000W Cyclone mid drive kit both on the roads and on the trails. Although the CVT is heavy and difficult to install, it performed properly in a variety of conditions that I expected would completely destroy it. I found this document hidden on the internet showing the specs for the N171 for potential kit developers. This shows that the N171 is able to handle a whopping 7 hp (5000 watts), although the power must be pulse-free and less than 130Nm of force. The N171 was wonderfully overbuilt with a total of eight balls instead of the mere 6 balls that the newer N360, N380 and N330 have. 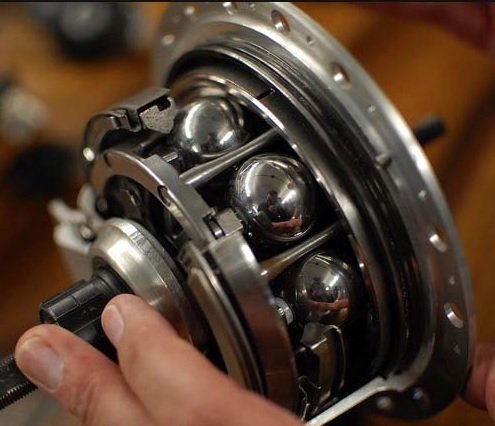 More balls means more surface area to contact which means you can use more force to drive the CVT. In my opinion 350% of range is more than enough for any ebike. One of the problems with this design is that it uses a freehub attachment that screws on. Most bikes have used a cassette system for a long time now, although you will still see freehubs on many hub motors. The freehubs on a hub motor do not need to be very robust as they only have to survive the force of your pedaling which is pretty wimpy in the general scheme of things. 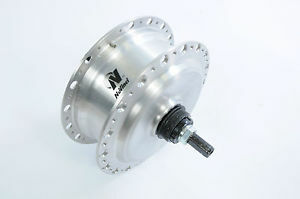 Once you start pumping thousands of watts through your drive train you will need to make sure you have a very robust freewheel like a White Industries one which runs about $100 online shipped. If you have a mid drive system with freewheels on the drive unit like the 3000W Cyclone kit that I tested this N171 with, then you can get away with using a screw on fixie gear. If your fixie is made of steel then it will not break. Your cheap Chinese Freewheel is no match for the power of the Dark Side. Get a White Industries freewheel or a fixie. What issues did I have with the installation other than the busted ebay freewheel? The biggest problems I had were setting up the shifter. For whatever reason the old N171 shifter is much more difficult to install than the newer N380 shifter. The cable ends up wrapping around the hub shifter housing several times and it is very tricky to get the whole thing setup and shifting right. For a job that took me about 15 minutes on the N380 shifter, I ended up pulling out my hair for about an hour on the N171 shifter. In the end, I learned to read the manual (several times) and take my time and be patient with it. If at first you don’t succeed, don’t worry about it because you’ll probably get it on the 5th or 6th try. This cutaway shows the balls in action. Building up the hub was pretty time-consuming and annoying so I paid Larry at Boxy bikes $100 to do it. I had read somewhere that the spoke heads should all face toward the inside, so he did it that way. Building up wheel sets is a major PITA that everyone should do at least once just so they can cross it off their bucket list. Make sure the number of holes in your rim matches the number of holes in your CVT as there are 32 hole and 36 hole versions. 32 hole fat bike rims are everywhere, good luck finding a 36H fatty rim. The only one I’ve been able to find that is not astronomically expensive is the Weinmann rims which are pretty heavy, especially the double wall\unpunched out ones. If you’re not building a fat bike then suddenly you have a whole lot of options for lightweight 36H rims. A really bad N360 MC Escher wannabe selfie. As far as complaints about the N171, my primary complaint is that it is nearly impossible to shift into a higher ‘gear’ when the hub is under power. Even shifting into a lower gear is also hard, but not impossible. When you try to shift into a higher gear you have to twist so hard that it feels like the shifter is going to break. Not good. You best bet is to momentarily cut the power when shifting the CVT. Like it’s N3xx cousins it also cannot shift all of its range from a standstill. It can shift about 40% of its range from a standstill, but you need to turn the CVT slightly in order to get access to the rest of the gears. This might be an issue if you city commute often and go from 30mph to a dead stop and forget to downshift before the light turns green again. For most cyclists this is not really an issue. The rear hub housing and the shifter both had annoying clicks that you could hear and feel. On the hub housing, I traced it down to the end of the cable which was sticking out and hitting the cover and snapping back when the CVT was adjusted. I wasn’t brave enough to take apart the shifter housing to find out why that was clicking, although it seemed to happen a lot more when I was shifting under power. My biggest complaint on the N171 was the weight. Because it is so drastically overbuilt, I would not recommend it with a BBS02 or even a BBSHD. For those drive units I believe you will get along fine with a N380 (don’t buy the N330, too wimpy). Although the N380 will void the warranty when you run more than 350W though it, I have tested it extensively at 1300W without any issues that I can see. I have heard that over time high power can make the balls be ‘pitted’ and stop working as well, although I have hundreds of hard hours on mine without noticing any slippage. The fluid can also overheat and then leak out, but again I have not seen that issue on any Nuvinci CVT I have owned. In truth, I have been very impressed with every Nuvinci product I have touched, as well as the guys in the Fallbrook customer service department who tolerate my stupidity reasonably well. If you want to get a Nuvinci N171 your best bet is to look on ebay and endless-sphere. There is a surprising number of them out there, and often people do not even really know what they are but are still selling them as ‘Nuvinci’ hubs. You can usually find them for about $100-200 shipped. If you need parts for them from Fallbrook tech, they will be hard to get as this drive has not been sold for about 5 years. If you want a CVT for riding in the woods I highly recommend a N380 with a detuned BBSHD, its several pounds lighter with a much easier install. Program your BBSHD throttle for ‘current’ rather than speed and make sure your ‘start current’ is set to 10 or less if you are pairing it with a N380. Awesome info, thanks! I always wondered what the differences are between the various NuVinci models, plus where they stacked up against each other in their “true” power ratings. Now I know where to go to refresh my memory about these. As far as “true” power ratings go I started with a 360 strapped to Cyclone mid drive 3kw and 52 volts. Got about 10000 miles of abuse out of it before it failed completely. I also had problems with the internal freewheel. I swapped it out with a 171 I got from Jim (below) I have at least 10k miles on this one with absolutely no problems at all. For the “legal” mid drives the 360’s will work fine but ease into it and start at a lower range. The freewheel is the weak link and the parts are rather expensive. As far as the 171 goes I wouldn’t hesitate to go for more I am at a point now I would need a stronger bike frame. I bought 2 new old stock Nuvinci N171 on ebay several months ago for 150 each. I got nuvinci to send me the freewheel tool for shipping cost. I am not going to use them because I don’t know how to lace a wheel. I will sell them for the same price I paid if anyone is interested. They are complete with instruction manual. Thanks for posting this Jim, I’m sure someone will buy them. you still have these? I’ll buy them. I sold one of my units to Larry Hammer over the weekend. I included the tool that I got from fallbrook tech with his unit. However, Fallbrook tech sent me the tool as a courtesy, I paid only shipping. I have one unit left, it is a black 32 spoke and I will sell it for $150 that I paid for it. Great article. I have an N360 with BBS02 on a Kona Ute (Cargo Bike). After removing and replacing my rear wheel several times, I can finally say I know how to line up the inner hub and the extra cables that have to be disconnected and reconnected in order to shift. My advice. 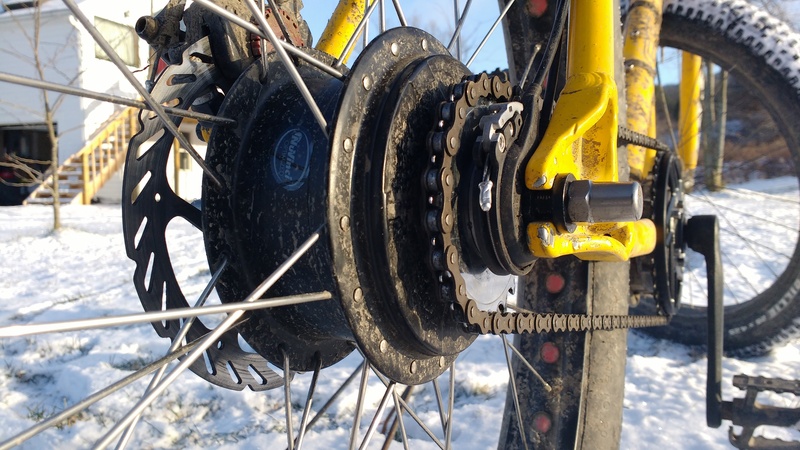 learn how the hub works at home and not in 20 degree weather when you have caught a flat. I have been using a Nuvinci 360 paired to a 1800 to 3000 Cyclone at 52 volts for a couple of months now. The bike is street only and I don’t shift under power. It is holding up and doing great. Regardless of the “250 w max” you could pair one up to a 750w and expect no problems at all. After another 5 months of hard street riding (>5000 miles) it did fail me, but I still see no problems at 750watts or less. I have the n360 on a ebike,powered by a 750watt bafang.Not having any trouble,touch wood.I put on over 900km.Great article,thanks. I got a question: can you mount a disc brake to Nuvinci N171? If you have the adapter. I had a spare but gave it away. 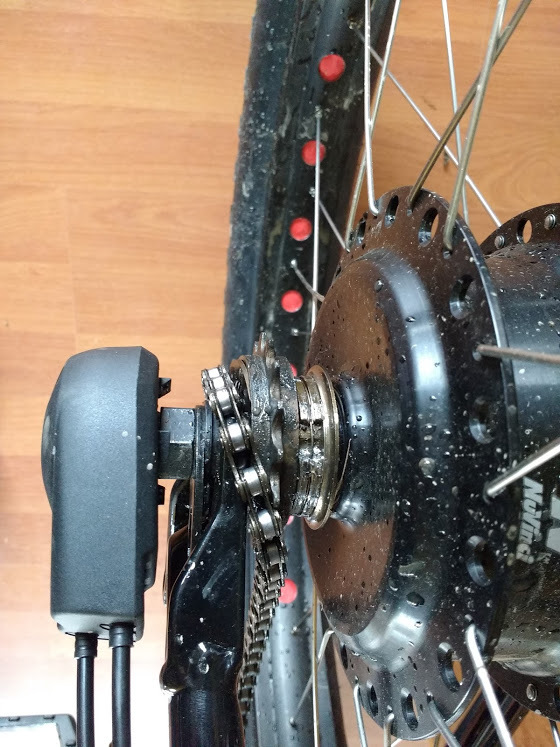 I’m using a Nuvinci 360 with a disk brake,My bike is also fitted with the bafang mid drive.Know problem after three years and close to 2000 km.Works just fine and enjoy if i can say the smooth shifting.I sure don`t miss having to jam the gears. If you want start current to be higher then go with Current mode (less powerful) if you want the start current to be lower then you can use speed mode (more powerful). Almost all my units are set for speed mode. Not a fan of current mode. Thanks for noticing the discrepancy. I can tell you (without telling you how I know) the N171 is fantastically overbuilt. The problem you’ll have destroying it isn’t so much power as torque pulses. They’ve been run with 2 and 4 stroke ICEs with good life expectancy. The more you can dampen the drive train (cush drive, soft couplings), the better. I do not recommend using disk brakes with the N171 with higher weights or higher speeds associated with motorized bikes. The disk attaches to the shell cover, and it can slip and work loose if . (I wouldn’t even use it for human-powered, but that’s just me). Rim brakes are the way to go for this setup. Aug 27th 2017 I have a few brand new N171 for sale. The Holy Grail of the CVT’s. Still factory fresh, and for a bit extra I have the adapters for Disc Brakes! Don’t expect to get one of these cheap. Everybody is looking for these.